To the ambitious entrepreneur, nothing has greater appeal than the prospect of an outstanding turnkey business. A business model of some kind that has already been devised and established, ready and waiting to be taken over by a savvy go-getter with a taste for success. In a sense, turnkey businesses are a little like templates. All the complexities are mapped out, simplifying the process of getting the business up and running. Unfortunately, not every business template that presents itself represents an advisable solution. In the world of web design, it’s difficult not to be tempted by the prospect of free or cheap templates available in abundance. Countless templates – some of which could be genuinely impressive – ready and waiting to help you build your business in no time at all. Add it all together and you find yourself believing you really have nothing to lose. In reality, one-size-fits-all solutions don’t actually exist. At least, not if you intend to build a successful and unique business. The problem being that while prefabricated website templates can be great to an extent, they also bring any number of limitations into the equation. Precisely why you will never come across a professional web design and development team that’s willing to use generic website templates. First up, establishing a successful business means creating a comprehensive road map and putting your strategy into action. Everything about your business is mapped out prior to implementation, on the back of market research, audience analysis, technical expertise and so on. Unfortunately, working with a prefabricated website template renders this process impossible. Instead, you are forced to adapt your business plan and strategy to whatever the template will and will not allow. Layouts, CTAs, colours, navigation etc. – you’re limited to the flexibility or otherwise of the template. All of which means that your initial business vision may never come to fruition. You can pretty much guarantee that whichever template you decide to use, you won’t be the only entrepreneur to do so. In fact, it’s entirely likely that dozens, maybe even hundreds of other businesses just like yours are already up and running with the same basic template. For obvious reasons, this can make it extremely difficult – if not impossible – to stand out from the crowd. The more difficult it becomes to distinguish your business from those of your competitors, the less likely it is you’ll emerge as a leader in your field. One of the biggest problems when working with generic website templates is that you have little to no idea what’s going on behind the scenes. You didn’t code the website personally, nor did a team of experts do so on your behalf. In turn, you can’t be sure that there aren’t any number of hideous errors and omissions in its coding, which could have a hugely detrimental effect on the performance of your site long-term. You need to remember that in many instances, website templates are thrown together in no time at all as a quick and easy way for their respective providers to attract customers. Particularly in instances where templates are offered free of charge, how much time and effort do you think have been invested in their development? Likewise, it’s practically unheard of for free and/or cheap templated website services to be backed by any kind of customer support or aftercare whatsoever. One of the most beneficial aspects of working with a team of experienced developers is the way in which they can provide on-going consultancy, technical support and general assistance at all times. When you go the generic templated route, you’re pretty much on your own. Things may run smoothly enough at first, but what happens further down the line when you encounter potentially serious issues? The overwhelming majority of newcomers to online business have every intention of expanding and evolving their websites over time. Attracting more traffic, better conversion rates, larger or more powerful websites in general and so on. Unfortunately, the vast majority of website templates provided for next to nothing are extremely limited in terms of scalability. Sooner or later, you will reach a point wherein it is impossible to take your business any further than its current position. One of the key benefits of professional website development is limitless flexibility and scalability. Anytime your website needs to grow or adapt in some way to the needs of your business, the necessary changes can be implemented in an instant. Your website represents the single most important element in your wider branding strategy. Each and every aspect of your site from top to bottom should represent a strong and consistent reflection of everything your brand stands for. Your colour schemes, your fonts, your logo, your imagery, your story – all of the unique attributes that separate you from the competition. When working with website templates, you are once again restricted to the customisation and general design elements that template allows. Even if there is a decent amount of flexibility, you will not be able to focus on brand development to the same extent as with a unique website, designed and developed exclusively for your business. Most decent website templates on the market these days offer at least a certain amount of mobile compatibility. To such an extent that accessing the website and viewing its primary content may be possible, if not particularly convenient. Nevertheless, it is a fundamental requirement for today’s online business to ensure that every mobile visitor is provided with the same flawless experience as every desktop visitor. Something that simply isn’t going to happen, unless your website is designed and developed from scratch for your business exclusively. Don’t forget that Google and the other major search engines have made it abundantly clear that websites failing to focus sufficiently on mobile are doomed to fade into obscurity over the coming years. The vast majority of website templates are essentially empty shells. 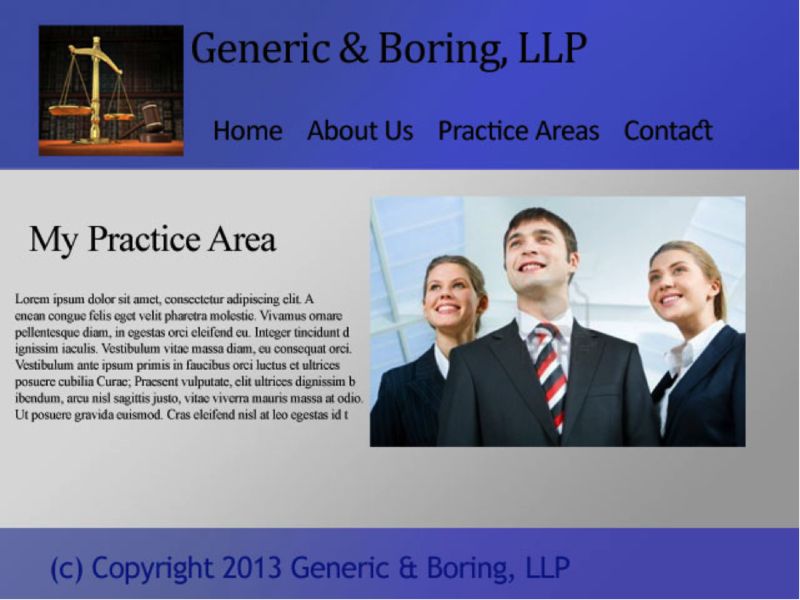 A basic frame, which can then be used to create a somewhat generic website. Once again, where website templates represent the cheapest (or perhaps even free) option available, you can’t expect them to have been designed with powerful SEO in mind. Even if you take things to extremes with your own on-site and off-site SEO efforts, a website that hasn’t been designed from the ground up to climb the SERP rankings isn’t going to. To contend with such an extraordinary competition on a global basis, SEO demands heavy and continuous focus from the moment your site’s first line of code is written. It’s all well and good to invest heavily in the design and development of an attractive and functional website using a template. But what happens if a new or existing competitor decides to pretty much rip-off every aspect of your site’s design profile from to bottom? Given that you don’t technically own the rights to the template, you’ll probably find there’s nothing you can do about it. Unfortunate as it may be, this is the kind of thing that happens on a surprisingly regular basis. Particularly when it comes to low-grade affiliates and those looking for the quickest and easiest way to turn even a paltry profit, ripping off the design elements of others wholesale is a common tactic. It’s therefore significantly safer to have your website designed and engineered from scratch on your behalf, resulting in your exclusive ownership of the digital property. Last but not least, having no real idea as to what’s gone into the coding behind your website means risking any number of potential safety and security issues. Particularly if you intend to sell any kinds of products or services online, it is imperative that you invest heavily in the safety and security of your customers. Anything to the contrary could put the future of your entire business in jeopardy. Once again, safety and security is something that needs to be prioritised from the very first line of code. Even with concerted efforts to bolster safety and security, doing so can be difficult or even impossible if the basic framework of the website itself isn’t up to scratch. There are instances where website templates can be extremely useful. For example, if looking to set up an online portfolio of work, a non-profit website as a hobby, a basic blog or similar, you may get away with a generic template. By contrast, if you intend to set up and operate a serious online business, templates simply aren’t the way to go. Everything you stand to save in terms of initial expense and development efforts you subsequently stand to lose by way of the disadvantages listed above.